There’s no doubt that some animals can learn to understand some of what we say to them — look at Chaser the Border Collie, who’s been scientifically shown to know 1,000 words. But that’s not what’s going on when most of us talk to our pets. I chatter away in full sentences to my Pugs, despite the fact that they have both gone deaf. I also talked to the zoo animals I used to care for, greeting them in the morning and scolding them for not finishing their meals. What is it that we get out of talking to our pets? And what do the animals gain from it? We spoke with a few experts on dogs and humans to get some insight. What Do Our Pets Get Out of Our Speeches? Alexandra Horowitz, author of Inside of a Dog, does research into how dogs think, but she’s also interested in how people talk to them. She collects these one-sided conversations — like the owner overheard saying to his dog, “Last pee for a while, buddy,” before the recent snowstorm in New York — on her Twitter feed, with the hashtag #thingspplsaytotheirdogs. Ask any dog trainer and she’ll tell you that most of us, even when we think we’ve taught a command, haven’t done a thorough enough job of repetition and training in different situations. But even if our dogs do come to recognize individual words, they don’t understand the ever-changing nature of sentence structure. “Even the most skilled police dog, who can do incredible things if you say, “Go find!” won’t know how to respond if you say, suddenly, “Go circle!” she says. So when Horowitz overheard a woman saying, “No, that isn’t food. No, I mean, that isn’t food for you,” we can be sure her dog didn’t get the difference between those two sentences. However, if she spoke in a stern voice, the dog probably got at least part of the intended message. It seems obvious to most people that dogs pick up on the emotions conveyed in our tone of voice. But what we think is obvious doesn’t always turn out to be true when scientists do the research. For instance, that guilty look doesn’t mean what you think it does. In the case of our tone of voice, though, the science backs us up. Emily Bray is a graduate student in animal learning at the University of Pennsylvania who’s worked with Brian Hare of the Canine Cognition Center at Duke University on how dogs of different temperaments respond to intonation cues. She says that many studies have shown that a dog’s behavior is affected by whether a person speaks in a friendly tone or an intimidating one. 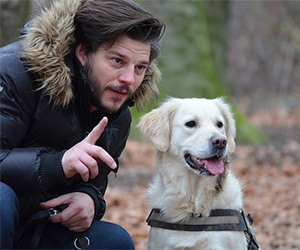 For example, dogs may understand what a pointing gesture means, but their reactions change depending on how an experimenter speaks to them. So when you talk that squeaky baby talk to your pet, he’s probably getting exactly the affectionate message you’re intending. Similarly, animals — including us — use short, repeated vocalizations when excited. In fact, one difference between experienced dog trainers and the rest of us is that trainers are better at using intonation to communicate effectively. So dogs do get some information from our speech, but they’re definitely not getting the full details of the long conversations that some of us have with them. So why do we do it? I often joke that it’s a great idea to have pets if you like to talk to yourself, and Horowitz has observed that a lot of what’s going on is that we’re simply narrating what’s happening in our heads. But there’s more to it than that, and it’s because sometimes dogs, at least, do pay attention in ways that matter to us. Another aspect of it, though, is what animals don’t do. For one thing, they don’t interrupt to tell you their story. “Talking to people can be helpful, but often people are listening solely with the expectation that when you stop talking they can begin,” therapist Allen Wagner says. And what you say to a pet stays with the pet. “Not all people have close people in their lives they trust, and confidentiality with your dog or cat is a given,” he says. Having whole conversations with your dog on the street may annoy passers-by (and you might end up quoted in Horowitz’s Twitter feed), but as long as it’s not affecting your relationships with others, Craig thinks it’s not a problem. But what about my talking to the zoo animals who didn’t respond the way a dog or cat does? Is that crossing the line? Craig suggests that another reason we talk to animals is simply that we’re obeying the deep-seated social instincts of our species.